My grandma’s Ukrainian borscht recipe adapted to a pressure cooker. Serve this hearty cabbage and beet soup with lots of dill, garlic and sour cream. So good! In Instant Pot, add ingredients in the following order: cabbage, beans (if using), potatoes, beets, carrots, onion and chicken or bones (if using). Do not stir. Pour water and then add on top tomato sauce and paste, maple syrup, bay leaves, salt and pepper. Do not stir. Close the lid, turn pressure vent to Sealing and press Pressure Cooking on High for 35 minutes. After Instant Pot has finished cooking, let Instant Pot borscht stand for 15 minutes or longer. And then release pressure using Quick Release method by turning valve to Venting and open the lid. Add lemon juice, fresh garlic and dill. We like lots. Stir and adjust any seasoning to taste. Store: Refrigerate in an airtight container for up to 5 days. Freeze for up to 3 months. 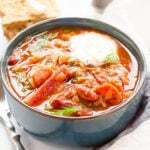 If you are not a fan of thick bean based soup cooked with dried beans skip the beans. If you would like to use canned beans, please use low sodium and adjust cooking time to 30 minutes and immediate Quick Release is OK. Substitute tomato sauce with diced or crushed tomatoes. Substitute maple syrup or honey with any sugar. Instead of lemon juice use white or apple cider vinegar.